In this Boogie Bear Creations AI2 review, find out what we love about these beautiful cloth diapers made in Vermont, USA, and why they've become one of our favorite brands! What size did you purchase? - one-size with snap down rise. A few months ago, Boogie Bear Creations submitted a profile to our Custom Diaper Makers' Directory. I knew that I really wanted to try them after every single reader review came in 5 stars. 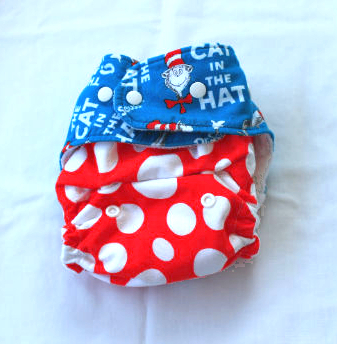 And when I saw Melissa post a photo of an adorable Dr. Seuss AI2 on her Facebook page a few weeks later, I quit trying to resist, and ordered one - but I had it sent to my sister, Karlee, who is relatively new to cloth diapers, but has tested out several brands on my nephew. Karlee had already heard of Boogie Bear Creations, made by Melissa Boisvert, a Vermont-based work-at-home-mom of 3. In fact, she had been itching to try one after seeing Boogie Bear featured in a few reviews and giveaways. So I couldn't wait to hear what she had to say when she received the diaper in the mail! According to Karlee: "This diaper is definitely one of the nicest, easiest to use diapers that I have ever tried. 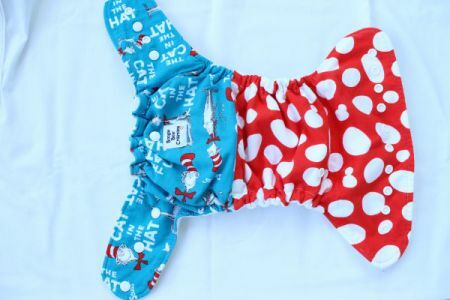 Boogie Bear Creations goes above and beyond to make their diapers a truly unique product. 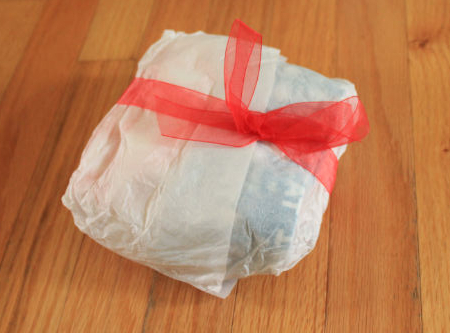 The product came wrapped in white tissue paper and tied with a beautiful red bow – it made the diaper even more special and let me know the diaper was made with love and care. Boogie Bear Creations has a fantastic product and I every time I put it on my baby I know his bum is well covered! 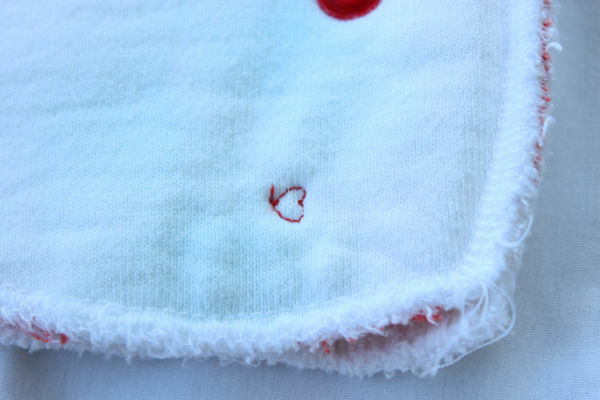 The construction of the diaper and insert is of the highest quality I have seen and the cute heart embroidered on the insert is a wonder, personal touch. Thanks Boogie Bear!" The fabrics and materials used are wonderful quality and the prints and designs are absolutely beautiful! This diaper is super high quality and wonderfully made! The convenient snap-in inserts are so easy to use and make assembly prior to use very easy and fast! The outer shell could be reused by just changing the insert when it became wet. The insert snaps in to the outer shell making it very easy to wash and assemble prior to use. This diaper was very absorptive. The Zorb in the liner did a wonderful job absorbing. The insert was made using super soft organic Bamboo Valour for next to babies bum. The insert is a double layer to provide extra absorbency and to decrease drying times. he Bamboo Velour did a fantastic job of keeping my baby's bum dry even after a few hours of wear. TThe insert also features a layer with the same great design as the exterior of the diaper, a fun, unique detail! This diaper has is trim and very adjustable! It features a snap rise that allows for full adjustability to suit a very small infant to toddler. The snaps are easy to use and are not at all bulky on the front of the diaper. The elastic around the legs provides a perfect fit to prevent leaks. The waist tabs provide cross over snaps and will allow for easy adjustability for all stages from newborn to potty training. The single row of snaps is very user friendly and made it very easy to do up in a hurry on a busy, squirmy baby! Boogie Bear Creations has a fantastic product that is of the highest quality! I loved everything about it. The only challenge I had with this diaper is that I found that the bamboo velour layer of the insert stained easily. I didn't think this was a big deal as no one sees the inserts once the diaper is done up! The staining is easily removed when the insert was placed in the sun to dry. Absolutely!!! On a scale of 1 to 4 (with 1 being never, and 4 being absolutely! ), I give Boogie Bear Creations a 4. When I asked Karlee: "If every diaper you owned was clean, would you reach for this one first?" her answer was, "Yes - this is one of the absolute favorite diapers in my stash - I'm planning to order more of them!" And, I'm hoping to get the Dr. Seuss Boogie Bear Creations AI2 back! Wish me luck! Boogie Bear Creations sells custom AI2s, overnight diapers, fitted diapers, and hybrid fitted diapers on Hyena Cart. They are available in a ton of cute fabrics, and you can choose between cotton velour and organic bamboo velour inners. AI2s start at $26 for cotton velour, and extra inserts are $7 to $8 each. Disclosure: I did not receive any form of compensation or free product from Boogie Bear Creations. The opinions expressed in this post are entirely my own, and your experience with the product may differ from mine. I only recommend products or services I use personally and believe will be good for my readers. I am disclosing this in accordance with the Federal Trade Commission’s 16 CFR, Part 255: “Guides Concerning the Use of Endorsements and Testimonials in Advertising.” For more information, see our Disclaimer and Copyright.